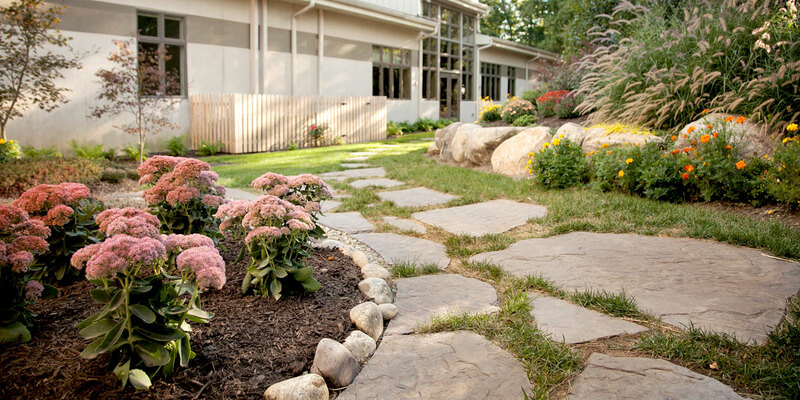 Through the generosity of several longtime friends, the Center has now created seven attractive garden areas with a stone walking path that leads visitors through the property and connects the various gardens. All of the gardens feature native horticulture and have led to recognition of the Wayne Art Center as a Birdtown location. In 2013, the Art Center received first place for the Radnor Township Beautification Award for its landscaping. Created in his memory, the Steven Laden Meditation Garden kicked off the Wayne Art Center’s landscape campaign. The garden serves as a source of inspiration and respite for students and community and reflects Steve’s lifelong love of gardens and understanding of the important cultural, aesthetic and biological impact of plants. 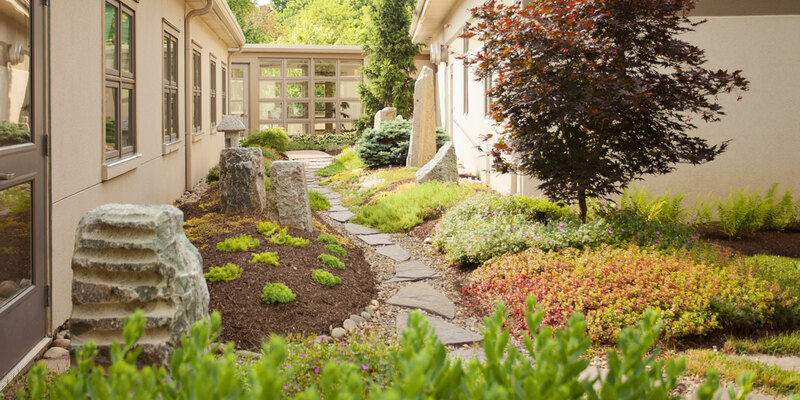 The result is a restful, peaceful place – an oasis of calm in a garden setting that helps students connect with their own creativity. The Schmidt Garden is a beautiful backdrop for the art displayed in the Davenport Gallery. 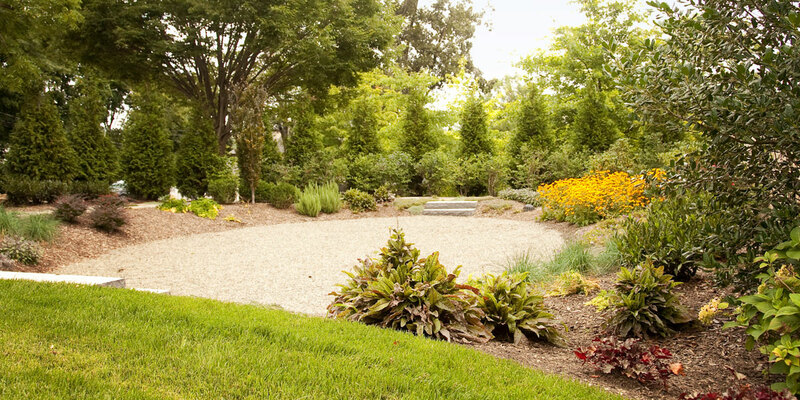 This garden surrounds a rain garden that was installed during our last major renovation project. It has an edible theme: including blackberry, raspberry and blueberry bushes, strawberries in addition to herbs such as rosemary and thyme. These edible plants are used in culinary classes as fresh ingredients. A terrace with magnolia trees serves as a beautiful backdrop for wedding ceremonies and receptions. These gardens are located in front of the Wayne Art Center building, adjacent to the parking lot. The new design brings freshness and new color to the area, welcoming students as they arrive for class. The Dorrance H. Hamilton Garden is a calming place where students can take a break from class and relax. There are now 15 varieties of woody plants and 18 varieties of perennials in the Hamilton Garden. The foliage provides privacy from neighboring businesses while setting a beautiful background for the adjacent studios. Boulders removed from the Radnor Trail during its construction form a semi-circular wall with built-in seating at the edge of the garden. The Children’s Garden, located next to the Radnor Trail, is a safe space for our youngest students to enjoy during breaks from camps and classes. Thanks to gifts from the Allerton Foundation and the McNeil family, the Children’s Garden features a rustic treehouse, an amphitheater, and animal sculptures by chainsaw artist Marty Long. 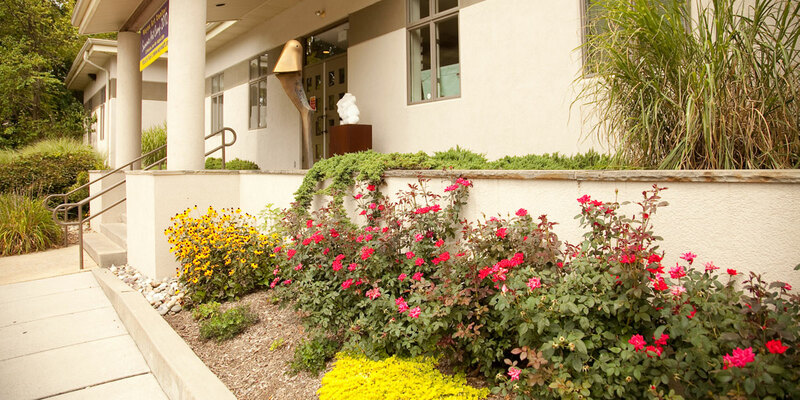 Located at our original entrance on Maplewood Avenue, the Lee Laden Maplewood Garden welcomes new visitors to the Wayne Art Center with flowers, trees and low foliage. The Wooded Knoll, a shaded area with large low boulders, is an ideal location for students to sit while sketching nature.